“We” are HR Healthcare Limited (company number 06790962) and we’re based at Unit 18, Waters Meeting, Britannia Way, Bolton, Lancs BL2 2HH. We operate the treated.com website, and we are the data controller for the purposes of the Data Protection Act 2018, the EU General Data Protection Regulation (GDPR) and any other data protection legislation applicable in the UK from time to time. You are not required (by law or by any contract with us) to provide personal information to us when you visit our website. We will only require you to provide personal information to us where it is necessary for us to provide you with a service at your request, such as when you contact us, register an account on our website or undergo an online consultation and purchase our products. We understand that any information concerning your health is particularly sensitive (known as “special categories” of personal data). We take extra precautions to ensure that any special category data is kept secure and confidential and we will only retain this data for as long as necessary for the purposes for which we collect it. Read more about how to upload your health records. You must be at least 18 years old to use our website and services. We do not knowingly collect any personal data relating to children. Analytical/performance cookies. These allow us to recognise and count our website’s visitors and to see how visitors move around our website when they are using it. This helps us to improve the way our website works, for example, by ensuring that users are finding what they are looking for easily. We use Google Analytics as well as our own first party cookies to provide anonymous statistics on how our site is used. Some of our performance cookies may be managed by third parties. We use Google Analytics to analyse how users interact with our website, such as how they land on our pages, and what routes they take when navigating the website. We may also record certain information users provide when they make a purchase or use one of our other site functions. The data we record using analytics is anonymous. This enables us to better understand the needs of our users, and make improvements to our site. We use Microsoft Azure Application Insights to monitor and improve the performance of LoopUp’s web application. ai_session lasts the duration of the session; ai_user lasts for 1 year. This allows us to see where users landing on our website have come from (such as a referring site). It helps us to understand what users visiting our site are looking for, and where our site is being referenced. Enables a user session to continue uninterrupted when our site needs to be switched to a backup server. Security feature, which allows us to ensure that the data we receive is from a genuine Treated.com user, and completed using one of our forms. Inspectlet works on the same principle as analytics, recording how users interact with the site. Again, this enables us to see what works well and what needs improvement on our site. This cookie is specific to our TV ad. It helps us to see how people who viewed our TV ad use our site, and better enable us to understand the needs of users. When a user is referred to our site from an affiliate, this cookie communicates to the affiliate hosting platform details about the purchase (if the user has made one). However, please bear in mind that if you don’t allow us to use certain cookies it may prevent you from accessing parts of our website or result in a loss of functionality which degrades your experience of the website. When you register an account on our website as a patient, we will collect and use your personal information in order to maintain and administer your patient account. This may be necessary in order for us to perform our contract with you or, otherwise, we have a legitimate interest to manage our patients’ accounts to facilitate purchases and communication between us. You may contact us at any time to close your patient account. However, please bear in mind that we may be required to retain your personal information in order to comply with our legal obligations. If you wish to purchase medicines on our site, you will be required to complete an online clinical consultation questionnaire. This information is reviewed by one of our doctors. If our doctor feels that they require further information from you after reviewing your answers, they will ask you to provide this via our secure chat facility. The information you provide during the consultation is essential to the clinical decision-making process. Our doctor and pharmacist need to know about your current health, your medical history and any other treatment you are receiving, so that they can make sure that the treatment being consulted for is safe and suitable for you. Your current health and medical status may also determine the dose of the medication they prescribe, the length of treatment required, and whether or not you need to seek medical attention in person. When you purchase any test kits from us, we will use the information you provide to notify you of your result and, if appropriate, suggest a course of treatment. Part of our service as a pharmacy involves notifying you when your medicine is due to run out. We will therefore send a courtesy email so that you can reorder your treatment if you are on a continuous prescription. We estimate when to send you a reminder email based on the quantity you have ordered. We will only send this email for treatments which are taken on a repeat basis. We may use your information to identify and tell you about our products or services that we think may be of interest to you. We will only do this where you have informed us that you would like to receive marketing communications, such as where you subscribe to our newsletter. You may update your preferences at any time by Contacting Us. We may also use your information to invite you to participate in patient feedback surveys and other market research. If we do contact you about market research, you do not have to participate. If you tell us that you do not want to receive market research communications, we will respect this. If you have already bought medicines or other products from us, we may contact you with information about similar products and services that we offer. We have a legitimate interest to contact you for this purpose, but you may object to receiving these messages at any time. We will only contact you by email or text message and you can choose not to receive these messages at any time. Simply follow the unsubscribe instructions in the message, or contact us. We always want to offer the best products, services and user experience that we can. Sometimes this means we may use your information to find ways that we can improve what we do, or how we do it. We will primarily contact you via email, SMS messaging and your patient area on our website to update you on your order. In certain cases, where our customer service team needs to contact you regarding your order, we may contact you by telephone. If our doctor needs to contact you regarding your consultation or test result, or needs more information, they will usually do this via your patient area. When you have a new message in your patient area, you will be notified by email. However on some occasions, our doctor may need to contact you via telephone to discuss your consultation or test result in more detail. If we have made several attempts to reach you by email or telephone and have been unsuccessful, we may contact you by sending a written letter to your home address. We may use your information where it is necessary for us to do so in order to meet our legal obligations and to detect and prevent fraud, money-laundering and other crimes. GoodCareIT, our sister organisation, a web development company which maintains the Treated.com website. GoodCareIT will only access your data in the event that there is a problem with your order which needs to be resolved. Our payment service provider, to process payments on our behalf. We will share your full name, address, phone number, email address and details of your order for this purpose. Our payment provider will collect and process your payment details; we will not store or have access to your full credit or debit card details. Equifax, the credit reference agency, for carrying out identity checks. All orders made through our site are subject to identity checks, in order to prevent online fraud. Your full name, date of birth and home address will be shared for this purpose. Third party couriers (e.g. DPD, Royal Mail or UPS) in order to arrange delivery or your order. We will only share your full name, postal address and phone number or email address. Your private or NHS GP. We will ask you during consultation if you would like us to inform your GP about the consultation you have taken and the treatment you have ordered. If you do, we will share with your GP the type and quantity of treatment you have purchased and/or been prescribed, the date the treatment was prescribed and, where appropriate, details of the consultation. If there is any specific part of your record or consultation you would prefer not to be shared, you can let us know and we will respect this. We strongly recommend that you permit us to inform your GP of the treatment you have received, so that they can continue to provide you with the best possible care. Partner notification services, either through SXT or the NHS. In cases where you have received treatment for a sexually transmitted infection (STI), and where you have given us permission to do so, we will share the partner notification code you have provided to us with the service provider that issued it. This informs the service provider that you have received the required treatment. No other details are shared with them. TDL Pathology, for processing samples where you order any test kit from us. The data we will share with them includes your name, your date of birth, and your test reference number. TDL systems meet all current EU requirements on encryption, storage and disposal of data. Clinical auditors and regulatory bodies. Our pharmacy is registered with the General Pharmaceutical Council and the Care Quality Commission. Our doctors are registered with the General Medical Council. Medicines are regulated by the Medicines and Healthcare Products Regulatory Agency. As such, our practices are routinely inspected by these regulatory bodies on a periodic basis. During an inspection, we may be required to share information about your consultation with an approved auditor. Contact management systems, to send emails, instant messages, social media messages and SMS messages. Where we provide you with any service, such as where you register an account as a patient on our website, we will retain any information you provide to us at least for as long as we continue to provide that service to you. We retain personal data relating to patient health care and prescriptions in accordance with the guidance issued by the Information Governance Alliance and the NHS (please see the links for detailed information about the minimum retention periods for different types of records). On the expiry of these periods, we will review the information that we hold and, unless we have a legitimate reason to keep holding that information (in accordance with our legal obligations and the purposes set out in this policy), it will be securely deleted. Generally, we may retain personal data relating to prescriptions issued and dispensed and other care records for a period of 13 years (for adult patients) or 25 years (for any patient who is pregnant). In all other circumstances (such as where you contact us without making a purchase), we will keep your information for a period of no more than 3 years. 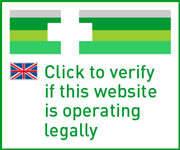 We try to ensure that all information you provide to us is transferred securely via the website (always check for the padlock symbol in your browser, and “https” in the URL, to ensure that your connection is secure). All information you provide to us is stored on secure servers in the UK. Where we have given you (or where you have chosen) a password which enables you to access certain parts of our website, you are responsible for keeping this password confidential. We ask you not to share a password with anyone. We have a legal obligation to provide you with concise, transparent, intelligible and easily accessible information about your personal information and our use of it. We have prepared this policy to do just that, but please contact us if you have any questions. In order to maintain the security of your information, we will have to verify your identity before we provide you with a copy of the information we hold. The first copy of your information that you request from us will be provided free of charge, if you require further copies we may charge an administrative fee to cover our costs. Please contact us to request access to your data. If you believe that any of the information we hold about you is inaccurate, incomplete, or out of date, you have the right to require us to rectify that information. You can update or change your personal information in the patient area on our website. Alternatively, please contact us so that we can correct our records. In these situations you have the right to require us to delete your personal data (although please be aware that we may be required to retain certain information in order to comply with our legal obligations). If you believe one of these situations applies to you, please contact us. Also known as data portability, you have the right to require us to transfer your personal information, in a structured, commonly used and machine-readable format, either to you or to another service provider. If you would like us to do this, please contact is. There is no charge for you exercising this right. We aim to always ensure that your rights and information are properly protected. If you believe that the way we are using your data is not justified due to its impact on you or your rights, you have the right to object. Unless we have a compelling reason to continue, we must stop using your personal data for these purposes. If you have any objections to our using your personal data for our legitimate interests, please contact us. In most cases, we do not require your consent to use your personal information in the ways set out in this policy. However, where we do rely on your consent (such as where you subscribe to our newsletter), you have the right to withdraw that consent at any time. You can use the “unsubscribe” links in any of the communications that we send you, or contact us to withdraw your consent. For example, you may wish for us to retain your contact details on our “do not contact” list to ensure that we do not send marketing emails to you in the future. If you wish to exercise this right please contact us. This version was last updated on 05/09/18 and historic versions can be obtained by contacting us.